I had a lot of very bad habits. I was a fairly active kid, but by the time I got to high school, I did pretty much no physical activity. I didn’t play any sports or really leave the house much, and exercise was limited to opening the cupboard and reaching for a Little Debbie snack. My eating habits were pathetic — I ate mostly ramen noodles, fried foods, snack cakes and Pop-Tarts. Most of my diet consisted of prepackaged junk, and the school lunches were pretty terrible too, with items like buttery macaroni and cheese, greasy pepperoni pizza and fried chicken. It seemed like everything was dripping with oil. Almost everything I ate was full of salt, sugar or fat. With my combination of terrible eating habits and the exercise routine of a snail, it was impossible to not gain weight. Fruits and vegetables were a foreign language to me. Kids in high school can be very mean, and I was tired of being the fat kid. I was tired of being picked on. I didn’t date much, and I didn’t have many friends. I wanted to feel “normal.” At 15, most of the girls I knew were starting to take an interest in fashion. I wasn’t able to do that, weighing 211 pounds, because I was a size 18 and the popular stores didn’t make clothes in my size. I also could feel my health deteriorating. Moderate exercise was too hard to handle since I was out of breath all the time. I felt like a prisoner in my own body. I knew if I didn’t do something to change my weight, those extra pounds were going to cause permanent health problems. I don’t believe in diets; I believe in lifestyle changes. 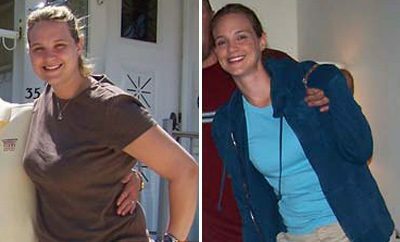 I lost weight through many small steps, and the biggest change was to my eating habits. I’m a foodie; I really enjoy eating, and I love trying new foods and recipes, so this really helped with my weight loss. I started these changes very slowly, first by switching from white bread and pasta to whole-grain, high-fiber products, and I got into the habit of eating several small meals a day. This helps me feel full throughout the day and keeps me from feeling tired. I incorporate at least one serving of fruits or veggies into every meal. Blueberries and spinach are two of my favorites. I buy low-fat salad dressings and cheeses, but I usually stay away from “fat-free” dressings and cheese, because a lot of fat-free things taste like plastic or cardboard and there are a lot of good alternatives that still taste amazing. Going to the grocery store is fun for me because there are always new things to try. Eating the same thing over and over can be so frustrating when trying to eat healthy, so incorporating new flavors and textures into foods really helped me to not get burnt out on any one particular food. I love to bake, but now I bake with applesauce instead of oil. My friends and family have been extremely supportive. They like when I cook for them, and it helps me stay on track knowing that other people enjoy what I cook. Another big lifestyle change is my exercise habits. Admittedly, I’m a lazy person. I hate breaking a sweat, but I started out very slow, just by going on a walk or a bike ride on nice days, and I found that just that small amount of physical activity made a huge difference. It also motivated me to push myself a little harder. Eventually, I got a gym membership, and I actually like going now. Each time I go (about three times a week), I do at least 30 minutes on the treadmill (walking at an incline) or the elliptical (with a higher resistance level). The gym has a lot of different equipment pieces, so I don’t get bored. I’m also fortunate to live within walking distance of many things in my city, so on nice days I walk to do errands instead of driving. 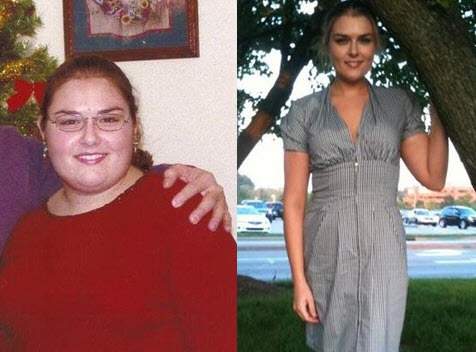 RELATED: Real Weight Loss Success Stories: Emily Lost 81 Pounds With Healthy Eating In Only 7 Months! Losing weight was actually not as difficult as I imagined it would be. After realizing how simple most of my lifestyle changes have been, I actually feel kind of dumb for putting the weight on in the first place. I don’t feel I have made any extreme changes, just baby steps. Keeping the weight off is sometimes a challenge, especially when I get cravings for junk food, but I have learned ways to treat myself without going overboard. If I’m craving ice cream, I can order a small size, or I can share with a friend. If I’m craving a burger, I don’t have to get a bacon triple cheeseburger combo meal with a large order of fries and a large 500-calorie soda — I can just eat a single junior hamburger. I like treating myself, now that I have figured out how to do that in moderation. Portion control is very important. Looking at before and after photos of me is a huge motivator. I don’t ever want to look or feel like that again. I am so much happier now with myself. Another nice bonus of losing weight is that I am now a size six, which means shopping is one of my favorite things to do. I rewarded myself with food for way too long. Now I can reward myself by buying a pretty size-six dress and actually fitting into it! After maintaining her weight loss for four years, Erica was ecstatic to go shopping for one dress in particular — her wedding gown. She’ll say “I do” at the end of this month. 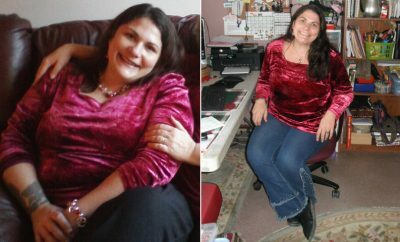 Erica’s not the only one who doesn’t believe in diets — find out how Cammy shed 100 pounds by focusing on getting healthy instead of getting skinny. Reading your story gives me hope that I to can lose the weight. Thank you very much for sharing and blessing us with your story!!!! what a beautiful girl ,good job!